In this article, we look at Enterprise Investment Schemes (EIS), Venture Capital Trusts (VCT) and Seed Enterprise Investment Schemes (SEIS) – useful for your CII AF1, AF2 AF4, AF5, J10, R02, R03 or R06 exam revision. These products come up often in various exams – most specifically R02, R03, J10 and AF4 but questions can sneak into R06, AF1, AF2 and AF5 as well. All three investments are considered high risk and can be illiquid. 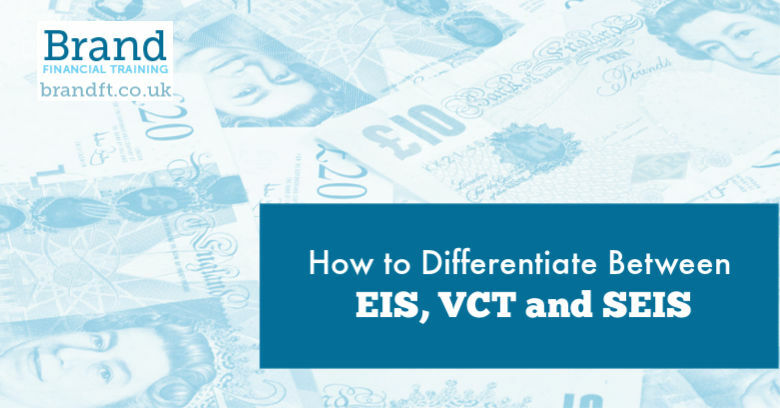 The SEIS is considered to be the younger sibling of the EIS, but the VCT is really quite a different product. VCTs are collective investments, which work in a similar way to investment trusts: investors subscribe to shares in the trust, and the fund manager invests in VCT qualifying companies. VCTs are suited to investors who wish to receive tax-free dividends, want to reduce their income tax bill and also perhaps for those who have maximised pension contributions. EISs are suited to those who want to take advantage of deferring capital gains tax, who want to reduce their income tax bill AND want to do some IHT planning. With an EIS, they can do all this at the same time! The CGT deferral could be of particular interest to those who are planning on exiting the buy-to-let market. A buy-to-let property will potentially be subject to CGT at the higher rates of 18% or 28%, which can be deferred if the gain is re-invested into an EIS. You can also spread risk by investing in an EIS run by a fund manager (similar to a VCT), where the fund manager invests in qualifying EIS investments. As we all know, tax should never be the main motivator for choosing a particular investment. With all of these products there are risks: the risk that the company invested in will go bust, the investments each need to be held for a certain length of time for maximum benefit, and as we have said, the products can be difficult to cash in. If you’re studying for your CII AF1 exam, and you’re wanting a feeling of confidence on exam day, grab our free taster to try out one of Brand Financial Training’s calculation workbooks for yourself. Click the link to download the AF1 Calculation Workbook taster now! Alternatively, you can download the taster for AF2, AF4, AF5, J10, R02, R03 or R06 if you’re studying for one of those exams.